Security Council unanimously adopts resolution, removing Iraq from its obligations under Chapter VII of the UN Charter. Welcoming progress on resolving pending issues from Iraq’s 1990 invasion of its smaller neighbour Kuwait, including finding Kuwaiti or third-country nationals, the United Nations Security Council today eased some of its sanctions against Iraq. Unanimously adopting a new resolution, the Council called on the Iraqi Government to continue searching for Kuwaiti nationals and property missing since Saddam Hussein’s 1990 invasion, but terminated provisions in earlier texts that allowed the military enforcement of the measures under Charter VII of the UN Charter. Recognizing that the situation that now exists in Iraq is significantly different from that which existed at the time of the invasion, the Council decided that the issues of missing people and property will now be handled under Chapter VI of the Charter, which calls for a peaceful resolution of disputes. Another key provision of the new resolution is the Council’s decision to transfer the mandate formerly assigned to the High-Level Coordinator for Iraq-Kuwait Missing Persons and Property to the UN Assistance Mission in Iraq (UNAMI). Immediately following the action in the Council chamber, Hoshyar Zebari, the Foreign Minister of Iraq, who had attended the meeting, hailed the decision as an “historic landmark” in relations between his country and Kuwait. He told reporters that the resolution was making “Chapter VII a thing of the past and… concentrating on the present and the future.” Both countries were cooperating in good faith and managed to close all the files on Chapter VII issues. He added that such cooperation, culminating in the Council’s decision today, could serve not only as “a new beginning for relations between our two brotherly countries,” but also as an example to other nations seeking to settle disputes peacefully. 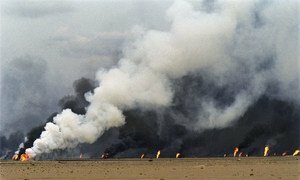 In the aftermath of Iraq’s invasion of Kuwait, the Council established the UN Compensation Commission (UNCC), which settles the damage claims of those who suffered losses in the invasion. As of January of this year, the Commission has disbursed some $40.1 billion for more than 1.5 million successful claims of individuals, corporations, Governments and international organizations, leaving some $12.3 billion remaining to be paid. The United Nations Compensation Commission (UNCC), which settles the damage claims of those who suffered losses due to Iraq’s 1990 invasion of Kuwait, today made $1.3 billion available to two successful claimants.